Bobby Charlton is of the most deeply-respected, celebrated and influential footballer ambassadors in the history of the beautiful game and arguably the most naturally gifted English football player ever. The knight commander of the British Empire notched up a whopping 49 goals for the English national team, becoming England's record goalscorer and broke the 100-cap barrier while sealing his majestic reputation as a righteous trailblazer and spellbinding soccer royalty. A FIFA 100 inductee, Sir Bobby Charlton won the prestigious European Footballer of the Year in 1966 and the first-ever PFA Merit Award, along with Cliff Lloyd in 1974. 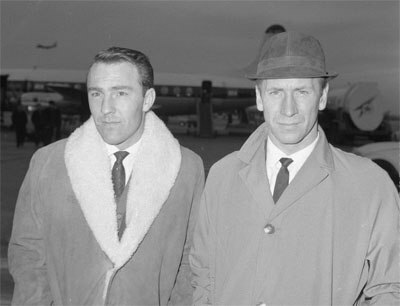 Bobby Charlton (to the right) and Jimmy Greaves in 1964. A short biographical expose tells that Bobby was born on October 11th, 1937 in the mining village of Ashington, Northumberland, son of a miner, but surprisingly, he got the right genetic baggage from his mother, Cissie Charlton, who was a football fanatic that was born into the Milburn family of professional footballers. The nephew of the legendary Newcastle striker Jackie “Wor” Milburn, the young Bobby idolized Newcastle United, yet he greatly admired key players from other English football clubs, especially Stanley Matthews who taught Bobby things like put defenders off balance and find space on the pitch. His innate determination, athletic abilities and constant training paid off as later in his professional playing career, there was no one that could surpass him over the first 10 yards. While still a schoolboy, aged only 15, Bobby Charlton joined the youth team at Manchester United, quite a weak soccer club at the time yet managed by the brilliant Matt Busby. He made his league debut against Charlton Athletic club, scoring two goals despite a sprained ankle. Throughout his impressive 17-year playing career with Manchester United, affectionately referred to as the Busby Babes, the mega-popular forward remained devoted to the club that propelled him to stardom, playing a record of 745 games and scoring a total of 247 goals for his team (a goal record that still holds, but can be beaten by Wayne Rooney). In the 1956/57 season, his team won a first title and in January 1958, a perfect hat-trick secured Charlton a regular first-team place. A month later, the Busby Babes sealed a spot in the European Cup semi-finals, but tragedy struck on their return to home soil. 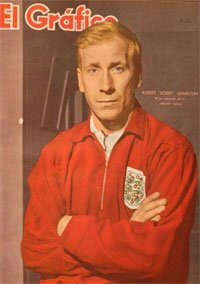 Twenty one people, including eight United regulars lost their lives in the airplane crash near Munich in February 1958, but Bobby Charlton, aged 20 survived and recovered from his injuries and traumatic experience to write history for both his club and England. With his instantly recognizable thunderbolt shot that inspired fear to the opponents even 30 yards from goal and his signature agility, body swerve and powerful tackling, Charlton was the epitome of speed and grace. His unmatched modesty, sense of fair play and gentlemanliness made him the ultimate sporting hero, admired and respected by both his team and his rivals. His lifelong friend, mentor and manager Matt Busby later said of Sir Bobby: “There has never been a more popular footballer. He was as near perfection as man and player as it is possible to be." Initially playing in the inside forward position, he then switched to a rewarding deep-lying forward role that made the difference for his team, as Manchester United won the First Division league championships in 1965 and 1967. The best at club-level was yet to come. As captain of the United, he scored twice in a 4-1 triumph over SL Benfica Lisbon at Wembley stadium, leading his team to win the European Cup (now the Champions League). Manchested United became the first English club to win this title. Sir Bobby Charlton made his international debut as a defensive midfielder (right-half) in the 1958 match against Scotland that ended in a 4-0 victory (one goal scored by him). In 1962, he notched his first FIFA World Cup goal against Argentina, leading England to the quarter-finals. His annus mirabilis on the international level came in 1966, when his inspired and dedicated play won the English national team the coveted World Cup. Despite a bad start, Alf Ramsey's side triumphed on home soil thanks to Charlton scoring two memorable, acrobatic goals in the semi-final win over Portugal. The second goal, an awe-inspiring first-shot cannoned into the top corner was signature Bobby Charlton. Soon after his retirement in 1973, Sir Bobby Charlton managed the Preston North End team until 1975 and later he was appointed director of the Wigan Athletic club. In 1984, the mega-popular figurehead became a member of the Manchester United board of directors and over the years, he played a key role in numerous English World Cup and Olympic Games bids, including the London 2012 Olympic Games campaign. His name is unequivocally etched in the hearts of soccer fans worldwide.